The recurrent theme of “home” connects the wide-ranging subjects of Lorna Knowles Blake’s Green Hill. These exquisitely crafted poems in free verse and metrical forms include conversations with such masters as Homer, Blake, Lorca, Saint John of the Cross, Giacomo Puccini, and Duke Ellington, in addition to reflections upon marvels of the natural world—oceans, flowering trees, birds’ nests. Green Hill is delightful, enlightening and inspirational, and an exceptional winner of the 2017 Able Muse Book Award. In the poems in Green Hill, Lorna Knowles Blake takes the intimacies of human life and the riots of nature and transmutes them into forms that both discipline and liberate their beauty. By doing so, she also reveals the real, the secret, sovereign of that beauty—the human imagination, of which hers is a triumphant example. Whatever subject Lorna Knowles Blake turns her hand to, she displays a prosodic surefootedness and a continual freshness of perception. Poems as different from one another as “Glosa” and “The Allure of the Ledge” will find readers to admire not only Blake’s skill but the literary culture that she makes her own. Lorna Knowles Blake gives us Green Hill, poems both dark and lightheartedly inventive, the craft casual, poised—and audacious. Here, our twenty-first century Blake boldly converses with her nineteenth-century namesake, William Blake, as well as with Duke Ellington, St. John of the Cross, and others in musically dazzling poems set “free to feel/ the hook, the dock, the sun, the real/ experience.” What is the real experience? It is the sense of home. The title poem begins, “So many ways to remember a house,” and Blake means all abodes, from a hermit crab’s shell to a “refugee’s home/ the day after the raid.” Relationships, too, become houses as Blake evokes moments of tenderness in a mature marriage and fears for the future—though in this deft, understatedly mythic book, the background world is still shades of green. 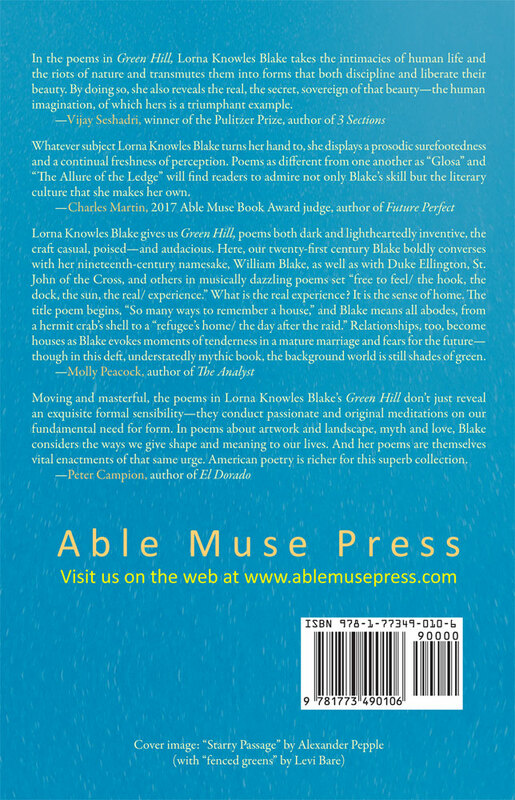 Moving and masterful, the poems in Lorna Knowles Blake’s Green Hill don’t just reveal an exquisite formal sensibility—they conduct passionate and original meditations on our fundamental need for form. In poems about artwork and landscape, myth and love, Blake considers the ways we give shape and meaning to our lives. And her poems are themselves vital enactments of that same urge. American poetry is richer for this superb collection. Lorna Knowles Blake lives in New Orleans and Cape Cod. Her first poetry collection, Permanent Address, won the Richard Snyder Award and was published by Ashland University Press in 2008. She serves on the editorial board of the journal Barrow Street and on the advisory board of Poetry Sunday, a weekly program of WCAI, Cape Cod’s public radio station. Her poems, translations, essays, and reviews appear regularly in literary journals, both in print and online. 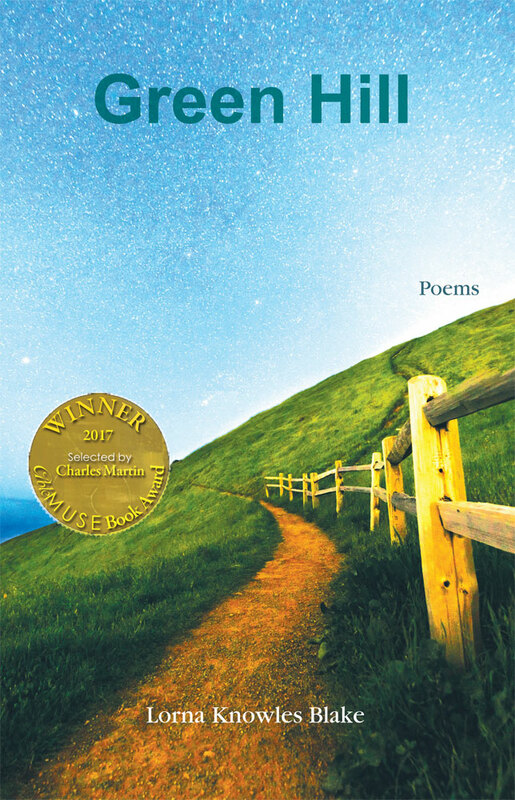 Green Hill was the winner of 2017 Able Muse Book Award.